We had booked the bus from Pokhara to Besi Saha (the traditional start of the Annapurna Circuit trek) a few days earlier through the company where we booked the porter. This was a journey of about 110km (68 miles) and was expected to take about 5 hours. But, we were feeling fine about the bus, it was a tourist bus and not the usual crowded local bus. The bus departs from the tourist bus station at 6:30am and cost us 400 NPR (£2.40) each. We had arranged for our porter to meet us at the hotel at 6am. But, at just turned 6am we went down and no-one was around. We sat in the garden in front of the hotel and waited. 5 minutes passed and no porter. Then 10 minutes passed and still no porter. We were getting worried so I tried to ring Guru, the owner of the company that we hired the porter from, but his phone was engaged. We were quite nervous as Guru had told us a story a few days ago about someone he’d employed in the past who had become an alcoholic so he’d let him go, but after a while he’d given the guy another chance so long as he cleaned his act up. Very charitable of Guru, but we didn’t know if this was a random story or whether he was talking about the guy we’d just hired. It was almost quarter past and still no porter, our worst fears seemed to be confirmed. We’d hired an alcoholic porter and he was late on the first day, possibly meaning we’ll miss the bus and be delayed. Finally, 15 minutes late and with only 15 minutes before the bus was due to depart our porter arrived in the taxi, ready to take us to the bus station. As well as his own small rucksack he had a huge ice axe and pick, a menacing looking piece of equipment which seemed a little bit of an overkill for what is in reality just a long walk! A few minutes down the road the bus slowed to a crawl whilst the conductor hung out the door shouting at the people on the street. (In Nepal the buses have no boards or information about where they are going, nor are there designated bus stands or stops, instead someone hangs out the side and shouts where the bus is going. In addition, there are no uniforms and the driver and conductor are almost always men in their 20s. Oh, and the bus door usually doesn’t close). Anyway, this was a very bad sign. In Nepal local buses seem very popular and demand far outstrips supply, so although a bus usually seats about 40 people it’s rare to see a bus carrying less than 60-70 people. All crammed in like cattle! The bus seemed to be a tourist bus because it started at the tourist bus station, but has quickly become a local bus. A few people jumped on and took the last remaining seats. We drove on a little, with the conductor jumping out regularly to shout in the street, before jogging back to the bus (all whilst the bus is still moving slowly down the street). As we drove along, more and more people got on the bus, squeezing themselves into the seats at the front or by the driver. Soon about 8 people were up front. But, just because the bus was full by our definition, didn’t mean it was actually full, we kept pulling over every minute or so for yet another person to get on. The Nepali definition of full is very different to our definition. By the outskirts of Pokhara every seat was full, the raised section up front (over the engine) was full and the aisle was full. BUT WE STILL KEPT STOPPING TO LET MORE PEOPLE ON!! Some little stools were provided for people in the aisle to sit on. A few more people got on and crushed in on the step by the door which doesn’t close. We were now out of Pokhara and free to drive down the main road without the constant hailing of people who’d rather crush into the first bus they see than wait for the next bus. So, the bus which had started out as a tourist bus was now just another ridiculously overcrowded local bus! The Nepalese seem to get travel sick very easily and as usual there were a few people onboard feeling sick. Every bus we’ve been on has had people demanding sick bags. The roads are in very bad condition, the buses are extremely cramped and the people do usually smell pretty bad, but this is normal in Nepal. Surely, if you get travel sick you would skip breakfast? Not in Nepal! Two people were being sick on this bus. They filled a bag each, threw them away and proceeded to fill another. The conductor must have been caught unaware because after two bags there was a sudden mad scramble to get a third bag for the person in the aisle who’d obviously eaten a large breakfast that morning. We arrived in Besi Saha at 11:30am and the bus stopped in front of a small restaurant. We went in to plan the next steps and also have an early lunch. Besi Saha is the traditional starting point of the trek, but the path has been replaced with a road (not a road as we know it but an extremely rough dirt track) which is very dusty and heavily used by buses, Jeeps and motorbikes. We had decided that rather than start here we would get a Jeep further up the road and start from either Bhulbule (pronounced BUH BOOL AY) or Ngadi Bazaar (pronounced NAH DI bazaar). Harry reckoned there was no point starting at Bhulbule as we’d still have to walk on the road to Ngadi. We decided to listen to him and try to get a Jeep there. The buses are annoyingly crowded and the prices are always subject to negotiation, usually starting at about twice a reasonable price and at least four times what the locals pay. As we sat and ate another British couple came in and sat at the other end of the table to us. We spoke for a while. They’d been in India for 4 months travelling around the whole country. We then discussed where we planned to start and where they planned to start (they had decided to start in Bhulbule). We told them what Harry had told us, about not bothering with Bhulbule, but their minds were made up. Instead, they were more interested in us having a porter. “How old are you?”, the guy asked with incredulity. “Huh, it’s not about age, we decided we’d enjoy the walk far more if someone carried our bag”, I responded. “After all, we can afford to pay for someone to carry our bag, so why not”? That pretty much ended the conversation we and decided we didn’t want to speak to them anymore. After eating we went outside to try and get a Jeep. I hate doing this! As a white tourist in a popular tourist location I’d be pounced on by every tout in the area, all trying to rip me off and get as much cash out of me as possible. The information we had from The Lonely Planet was the bus ticket should be about 200 NPR (but the book was a few years out of date and prices would be higher now). I’d pay a little more than that to get the Jeep rather than a bus though. I started asking and a few guys offered a price in the thousands for the Jeep, far too high I responded. Then someone else jumped in with 500 rupees each for a Jeep. Still too high, 300 rupees is the highest I’ll pay! The guy came down to 400 rupees each. There’s one thing I’ve learnt in Asia, if the other person quickly and easily drops the price by a decent amount they’ll agree on the demanded number sooner or later (besides I wasn’t asking a ridiculously low price, mine was a sensible and fair price). 300 rupees I said. The guy asked for 400 rupees, to which I yet again repeated, 300 rupees per person for 3 people to Ngadi by Jeep. This time he agreed and told me to wait by the restaurant. The British couple plus a German guy had been listening and asked how much to Bhulbule, they were told 300 rupees each, which is quite amusing considering they’d just heard him agree to 300 rupees all the way to Ngadi. He quickly settled on 200 rupees. He then ran off down the street, presumably to get the Jeep. Annemarie and I got our bags ready, but a Jeep didn’t park opposite the restaurant, a bus did. The guy beckoned us over. The bus was totally empty and waiting for us, engine off and driver wandering. Slightly confused we decided to get on anyway, the price was what we’d expected to pay and the bus was empty apart from us 6 people. The bus started up and drove very slowly down the street, in the opposite direction to where we wanted to go. A few people got on, then a few more, then a few more. Finally, after about 15 minutes driving down the street in the wrong direction the bus was full and turned around. But, it wasn’t properly full, the aisle still had plenty of space. So we drove back up the road slowly while the conductor attempted to persuade more people that they should get on the bus (the conductor must be trying to persuade people, otherwise they’d just get on the bus without any fuss). After 30 minutes the bus was back by the restaurant we’d started at, but this time it was full beyond capacity. We could now leave town. During the unscheduled stop a few people had got out to stretch their legs. The British couple had got out and found there were about another 20 people sat on the roof. Technically, the people weren’t sat on the roof, they were sat on the nice soft rucksacks filled with expensive clothing and equipment. The British couples’ bag contained an iPad and other goodies and someone had decided it made a nice seat. Whilst they were shocked at this we were shocked that they had put such a valuable and fragile object in the bag on the roof. A basic mistake to make, especially after 4 months in India. The British girl then started making a fuss and getting hysterical. Maybe I exaggerate a little… But she was getting loud and sounding angry (and high pitched and squeeky). She was refusing to pay full price for the bus for a number of reasons, firstly because people were sat on their bag on the roof and the bus was stupidly overcrowded and finally because a bus had come when the guy had said Jeep. Oh, and the funniest comment was that someone had sat on her (in Nepal people on the bus don’t care about other people. They will lean or sit on anyone they can). Again, it was hard to believe they’d been in India for 4 months! Renegading on an agreed price didn’t sound like a good idea to me, I’d read about westerners getting seriously hurt when refusing to pay the number agreed on. Still, we decided to see how this would end. It could get nasty (read entertainment) or they could get a reduced fare (read discount for us too). She bleated on and on, sounding angry and outraged at her situation. The conductor turned his back and ignored her. Amusing really, because her complaints got higher pitched. Eventually a deal was done after a few angry exchanges. The German guy behind them told us they’d paid half the agreed amount, only 100 rupees each. He said we should group together and demand a reduced fare too. I agreed, hoping that I would be able to go through with it and demand a reduction on a fare I’d agreed to, based on no real reason other than the fact that the locals paid about 1/6th of the fare we were been charged and some other tourists had just got a discount. The bus suddenly stopped a few minutes after the British couple had paid. There was a wooden shack outside and nothing else. We weren’t sure if this was Bhulbule (where they wanted to get off) or whether they were been punished for paying less and were just getting dumped in the middle of nowhere. (We discovered later that this was Bhulbule, which was little more than a crappy looking lodge beside the road, in a horrible looking landscape of dust, mud and huge amounts of construction work by the river). Our stop wasn’t much further down this horrible section of road. Diggers, JCBs, bulldozers, etc were everywhere. This was Ngadi Bazaar, the end of the bus route. It was nothing more than a construction site and a few lodges which looked more like shacks for the builders to sleep in. The air was filled with dust and the road was just a grey strip of stone and dust. Not a world class trek! By the road was a construction site. The river had been diverted and a huge concrete dam was been built. The noise, dust and pollution made to decision to walk to the next village about 90 minutes down the road an easy one (we had considered staying in Ngadi). Once we had our bags it was time to pay the conductor (this is the first time we’ve left it so late to pay for the bus, but I wanted to be at our destination and off the bus before paying, that way there was nothing the guy could about me not paying). We decided with the German guy that paying 200 rupees each would be fair. After all, we’d been told it would be a Jeep, but we got an overcrowded local bus. We gave the money to the conductor and explained why he was getting less. He argued back a bit, but had no leverage because we were at our destination and we had our bags. There was little he could do but argue and then give in and walk off. We introduced ourselves properly to the German guy. He was called Marco and was from Cologne. He’d just spent 6 weeks in India and was still near the start of his year long journey around Asia and South America. The three of us consulted the map and found we had no option but to walk along road. It took us 75 minutes to reach the village of Bahundanda, perched on the edge of a ridge overlooking the valley we had just walked up. The road had climbed gently from Ngadi until just before the ridge, where it then continued steeply up to the village. Upon reaching the village we were greeted by quite a few lodge owners, all wanting us to look at their lodge. We ignored most of them and headed up the steps to the lodge mentioned in the Lonely Planet. It wasn’t very good. It was very basic, the toilets were a long way off clean and the owner was rather pushy. We looked next door and it wasn’t really much better, although the owner wasn’t as pushy and seemed nicer. Not very impressed we went to look for other lodges and found one named the Swiss Alp lodge (or something similar). It had no resemblance to a Swiss chalet, but wasn’t too bad inside. But, the toilet was downstairs and the stairs were a very narrow and tight cast iron spiral staircase, not great for a toilet visit at 3am! We decided to pick the second lodge we’d looked at, mainly because the owner had been nice. The lodge owner was also desperate enough to get our custom that he offered the room for free (the other lodges had also offered rooms for free too). Rooms usually cost about 200 rupees ($2/£1.20) so it wasn’t a huge discount but it showed that times were not good. 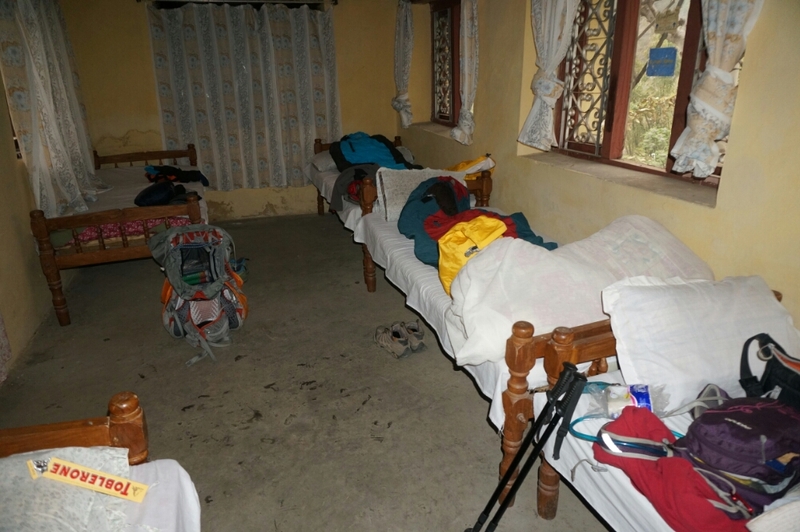 The road had caused a huge drop in the number of trekkers around Annapurna. The main reason was because the path had simply been replaced by a road (dirt track) and was now heavily used by buses, Jeeps and motorbikes. The road was dusty, a bit of an eyesore and annoying as it took away the charm and remoteness of the area. This has put many people off this trek and seriously harmed trekker numbers. The second reason for the drop in numbers is that many companies offer a reduced trek, starting up the road in Chame (about 4 days walk) and thus cutting out all the villages at the start of the trek. Bahundanda was suffering bad because of these two issues. Marco had a basic room in the main accommodation area and we were given a single room building all to ourselves. The room was a shared room with 6 beds in it and windows on all sides. Because the lodge was empty we could have the whole room to ourselves. We started to unpack and had soon covered all 6 beds with stuff. Then it was a quick shower and time to relax and enjoy the view. After eating we went to bed around 8pm. We’d been up since 5:30am and although most of the day had been spent sitting on a bus there’s something about the mountain air which makes everyone feel tired very early. In the room as we undressed and got ready for bed we saw a large spider on the end wall. It was about a hand span from leg to leg and would not run away when we banged the wall near it. Also disturbingly was what looked like rat droppings on the bed at that end of the room. We decided to sleep on the beds at the other end of the room instead. Then, an even larger spider appeared on the wall at the opposite end of the room. It was huge, the largest spider we’ve ever seen! Outside I spoke to the owner and he said they were harmless to humans, just pull the beds away from the wall. Not content with this we asked to have another room. Luckily, the lodge was empty and we could have any room we wanted. We grabbed the sleeping bags and went to find somewhere else to sleep. The next room required a massive spider searching session before we could get into bed and relax.